Men Oh Tokushima is the latest Japanese ramen chain to hit Los Angeles. Like the gourmet pizza/cupcake/burger, these shops seem to be popping up everywhere. However, the Little Tokyo scene has been rather quiet, with the likes of Tsujita, Yamadaya and Jinya opening up a presence outside of downtown. Sure, Shin-Sen-Gumi opened up a year ago to finally bring some competition (and relief for long waits) for stalwart Daikokuya, but there isn’t a whole lot of variety in the category (I dislike Orochon and find Mr. Ramen, Kouraku, and Chin-Ma-Ya to be second-rate at best). 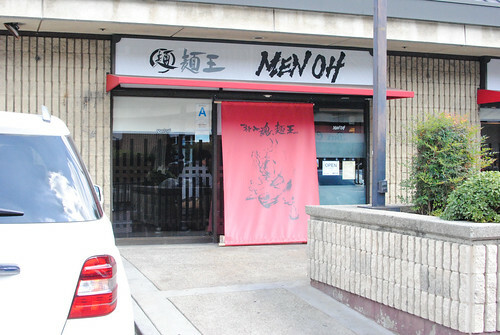 Just this past week, Men Oh Tokushima opened their latest US branch in the Honda Plaza of Little Tokyo. They already have 12 locations around Japan and a couple in Northern California, so it seems like a successful concept. Their ramen is a little bit different from what I’ve had before, a shoyu-tonkotsu hybrid native to the Tokushima prefecture in the south of Japan. I’ve had both shoyu and tonkotsu (probably my favorite) separately but never together, so I was definitely intrigued. Standalone shoyu and tonkotsu broths are also available. 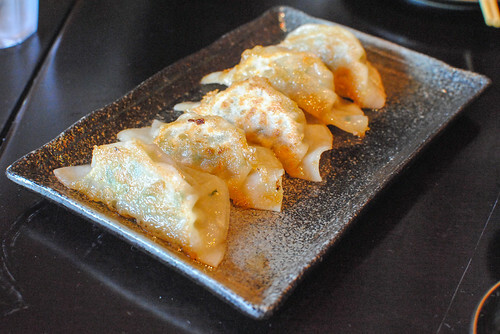 The gyoza had a delicate skin and a good balance of pork and cabbage. I would’ve liked more of a crusty sear on the pan-fried side though, and the fact that the gyoza rested in small puddles of its own oil resulted in some greasy, soggy dumplings if not eaten quickly. The karaage came out piping hot with a great crust and moist thigh meat. They did a good job of trimming the skin and fat, leaving an ideal ratio of meat to fat. 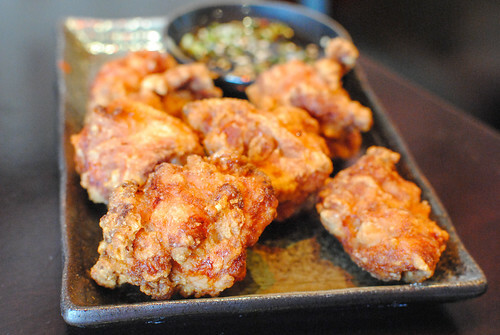 An addicting sweet/salty sauce of soy, sesame and scallions completed one of the best examples of chicken karaage that I’ve had. The Tokushima ramen tasted, as advertised, like a rich hybrid of shoyu and tonkotsu broths. The milky pork broth was there, but the sweet soy depth was also present making something pretty unique for me. I enjoyed it (though I may like pure tonkotsu broths better), and the toppings were tasty too between the two different types of pork. I liked the noodles but thought they could’ve been just a tad more al dente, they were a bit soft for me…particularly as I finished the bowl. 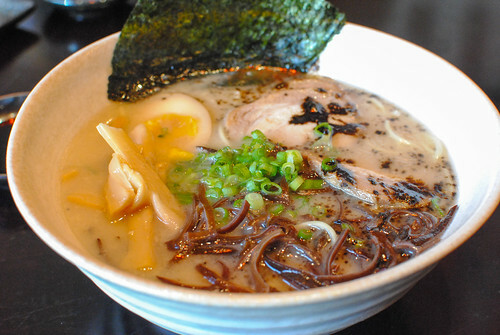 I also wanted to try the pure tonkotsu, something more familiar and comparable in LA. I thought this one felt lighter in flavor than what I was expecting, though still with a nice fatty sheen on top. Bamboo shoots, scallions and mushrooms made things a little more interesting, but this broth lacked the depth that the Tokushima offered. 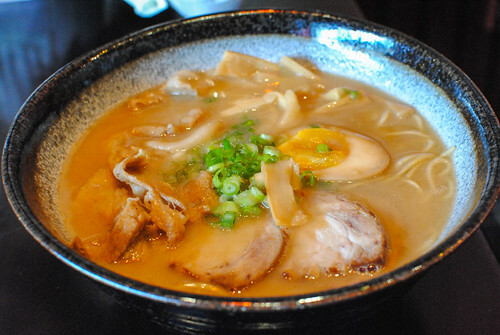 Noodle-wise, I had a similar opinion with the texture, though I preferred them over the straight Hakata-style variety. I thought Men Oh put together a pretty good meal. Their Tokushima ramen is something rather unique so it’s hard to directly compare, but I probably like the tonkotsu bowls at Daikokuaya and Shin-Sen-Gumi better (though I definitely prefer their tonkotsu over Men Oh’s tonkotsu). Having said that, Men Oh is something different and quite tasty on its own, so I’d say its worth a try (maybe for the chicken karaage alone). At the very least, I’m glad to have found another viable ramen shop in my neighborhood. Where does Santouka rank in there? Mmm that’s another diff type to compare with but generally I’ve enjoyed Santouka on par with Shin Sen Gumi. Not really a fan of having to eat it in a food court with small plastic spoons though..